Step out of the cold and embrace the storm! You are here: Home / Entertainment / Step out of the cold and embrace the storm! 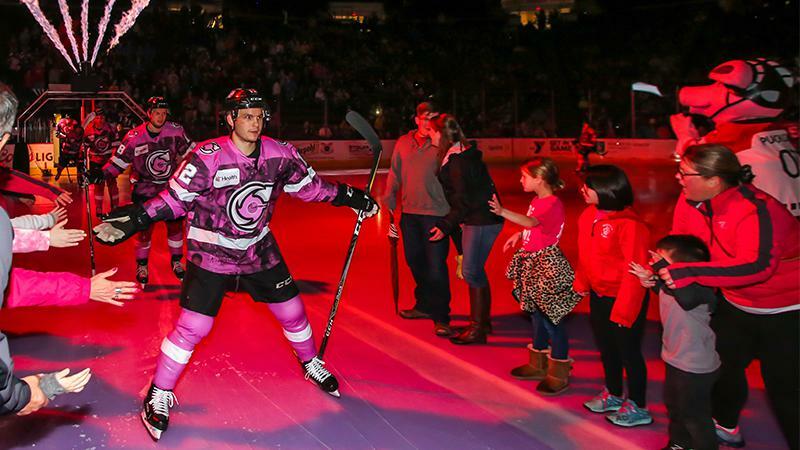 The month of February is full of exciting promotions for the Cincinnati Cyclones. It all begins on Friday, February 1st when the ‘Clones celebrate the City of Cincinnati for 5-1-3 Night. The Cyclones will give away a Genius of Water Fountain bobblehead presented by Talemed to the first 3,000 fans, plus, there will be 5-1-3 concession specials featuring $5 Craft Drafts, $1 Sodas, and $3 Burgers. The next night is our annual Cyclones Fight Cancer Night. The Cyclones will raise awareness for all types of cancer by wearing specialty jerseys that will be auctioned off after the game. After the first of three Dollar Beer Nights on Wednesday, February 13, featuring $1 PBR and Miller High Life, the ‘Clones will be honoring Cincinnati’s hog heritage and the Flying Pig by becoming the Cincinnati Flying Pigs for one night only on Friday, February 15. The Cyclones will once again be wearing specialty jerseys that will be auctioned off following the game, and throughout the game, ultramarathon runner Harvey Lewis and WLWT meteorologist Randi Rico will be continuing the marathon theme by running for charity. At the start of the game, these Flying Pig Marathon runners will run on a treadmill until the end of the second intermission. Fans can pledge a per mile donation to benefit the Alzheimer’s Association of Greater Cincinnati by visiting https://pledgeit.org/cyclones. The final major promotion in February is the annual Meijer Kids Club Game on Sunday, February 17. Meijer Kids Club members are invited to paint the U.S. Bank Arena ice following the 3pm matinee, and non-kids club members can purchase a Paint Pass for only $5. The Clones will wrap up the month with a pair of Dollar Beer Nights on February 20 and 21, featuring $1 PBR and Miller High Life.